Optimizing Images: Why Do You Need Alt. Text On Your Images? Alt text. Some may have never heard of it, others may have an idea about it. So, what exactly is it? Alt text, also known as alternative text or alt. tags, are used to describe the images on your business or personal web page. These tags do not have to be long, they do however, need to be very descriptive. Alt tags should accurately describe an image so Google can determine what the image on your website is depicting. Alt text can be quite useful and should be incorporated into your SEO efforts for a number of reasons. Search Engines – Search engines, read words not images. Having alt text on your images allows engines like Google to better read the image. Armed with this information Google better understands the page content and is able to give users better results when searching for images. SEO – When it comes to SEO, alt text gives you the option to place your main keywords in the description. Doing this will aide in getting better ranking on searches. However, you want to be sure not to add irrelevant keywords into your alt text as that could negatively affect the SEO. Accessibility – When it comes to accessibility, sometimes issues arise with a web page and not all users or visitors are able to see the images being displayed. 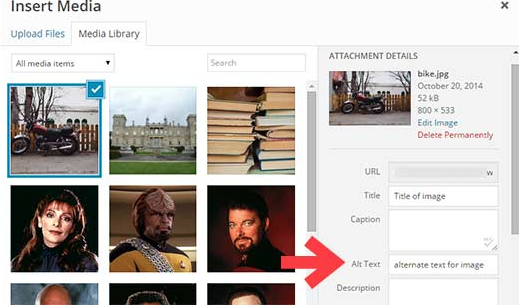 By including alt text on images, the viewer will now have a way of knowing what the image is depicting. If the text is not cohesive and descriptive, the viewer will not be able to obtain the best idea of what the image was supposed to be. Those who are visually impaired tend to use screen readers when going through a webpage. A screen reader goes through and reiterates back what is on the page back to the user. However, if there is just an image without any text, they will not be unable to fully understand the message of the page. When an image has descriptive alt. text, the screen reader is able to read what the image is, giving the user a better understanding of the page. Here are step by step instructions of how to add alt text attributes to images using WordPress and html. Alternative text is important to a wide range of business industries. This list gives ten industries that could benefit from adding alt text attributes to their images. As you can see, alt text plays an important role. Not only does it help with accessibility and user assistance, but it also boosts SEO through its use in aiding search engines. When adding alt text be sure that it is not too long while still being precise and descriptive. Alt text should get the main point across very clearly, important keywords can be added into the text however, do not add irrelevant keywords; which will hurt SEO. All in all, alt text is a key factor on images and you should always remember to add it in to improve your SEO rankings and ensure your website is optimized. Previous PostHow Long Will It Take To Get A Top 10 Ranking In Search Engines From SEO?